Today we went to the beach with my grandchildren. It was breezy, a little brisk, a little windy, but certainly a beach day. The sky was blue, the sun was partially out and the water pressed the shores of the ocean like music to my soul. There is music in the sounds at the beach. The air you breath, the sand on your feet and the tiny sea shells that represent the outer covering of something that used to be alive. The beach calls my name more than any other place on earth. The water calms me, the ocean amazes me and the majesty of God’s creations are everywhere around you. To me the beach signifies hope, birth, life at it fullest measure and infinate beauty everywhere you look. The beach uses your senses like no other place on earth. The sand on your feet, the salt in the water, the smell of the ocean air, the sounds of the rushing water and the majesty of the waves crushing high into the shore all make your experience even more magical. The beach represents freedom, youth, adventure and the hope for a better tomorrow. To watch a child play on the beach tells a story in itself, to see them laugh, imagine and explore the majestic scenery is a sight to behold. Today I made a memory. Today my granddaughter held my hand. Today her grandpa carried her over rocks, pebbles and huge mud pools. She laughed, she processed, and she became more enlightened in her beautiful surroundings. My grandson ate rocks, slid down muddy slopes and ran into unfamiliar places. He chased his dreams and ate string cheese, a part of a banana and teddy grams. He smiled at his grandpa, laughed at me and he just looked like something out of a picture book. Today I got a gimpse of what worlds without end really means. There are endless possibilites. This world is a beautiful place, and we just have to hold on and enjoy the ride. One glorious moment at a time. When I was a little girl I used to dream that I wanted to be a famous singer when I grew up. My mom has no musical background and she is tone deaf. The chances of me becoming a professional singer were pretty slim. However, my dad’s sisters used to sing and perform together when they were young. Also, my grandma Turner loved to sing and play the ukulele. I am more like my dad than my mom, so I continue to have hope for my musical aspirations. My music lessons consisted of one year of flute in the fifth grade band and one year of piano lessons as a teenager. I have always found it fascinating that I love music as much as I do, even though my background was weak. When my boys were little they all played the violin. Kailee, my only girl, learned to play the harp at the age of eight. 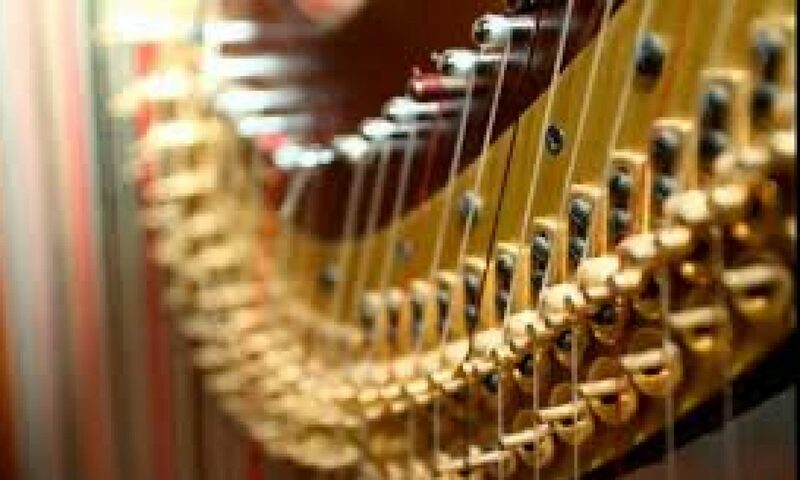 When she plays her harp, I feel incredible peace and know that heaven must be full of angels playing their harps at the entrance to heaven. About six years ago I was asked to be the chorister for our church. It was completely out of my league and I protested A LOT. However, after a lot of prayer and Temple trips, I accepted the calling. It was my greatest challenge, but also taught me to be patient and rely on the Lord. I grew to love the calling and found a voice inside of my head screaming to come out. I started taking voice lessons at this time and found that I was being challenged on a level that I had never experienced before. I started to enjoy singing and made some great strides. However, after about 18 months with the same teacher I knew it was time to make a change. It just wasn’t the right fit for me anymore. Last December I found a new voice teacher. Her name is Katheryn and she is kind, beautiful and makes feel good when I am in her presence. When I am with her I want to be a better person. My husband has been working in Frisco Texas for the last couple of months. We have been going back and forth and my life has been in upheaval. My only constant has been these voice lessons. The only peace I have truly had for three months is the days I sing with her. I have decided to do FaceTime lessons with her when I am in Texas. My first lesson is tomorrow. I hope it goes well. A dream is a wish the heart makes, when your fast asleep. “When words fail, music speaks”. I believe that music is the universal language and to live in this temporal world without it, would be a tragedy. Sometimes the only solace and peace I can ever find comes from a song that moves me. My dream is to someday find a purpose in my singing and maybe even touch someone’s life by sharing the feelings that I hold deep in my heat. There is power in the sound of music and with the Saviors hand involved sweet sound can always fill your soul🎶. I am sittin g on the couch in my sitting room in Alpine, Ut. I feel a stillness in my soul that I haven’t felt in a long time. I have come to realize that the sun, the mountains and the snow are all of God’s ingredients for perfection. I didn’t used to like the snow. It used to be a nuisance to me. It takes longer to drive in it, it gets your car dirty, it’s cold and it’s an annoyance at times. Yet; now that I am well over middle age, it has become a thing of beauty to me. I don’t like foggy days, cloudy days, rainy days or invesion days. But when the sun shines on the snow it is a direct message to me from heaven that God is truly at the healm. There is such an element of great majesty in all of God’s creations. I can only imagine what heaven must look like when I see the beauty of God’s hand in my little nest in Alpine, UT. We do not always control what’s on the inside, yet what is outside of our safety net has a lot to do with how we feel on the inside. Today the outside of my home is so beautiful that I want time to stop time at this very moment. I feel God’s presence in my life in a way that I haven’t felt in a long, long time. There is a picture of my family behind me and I honestly feel like they are all with me at this very second in time. Maybe each one of them is reflecting on the goodness around them and that’s why I feel like we are together deep in the fibers of our soul. Families are forever, it is the plan of the gospel of Jesus Christ. Even though my family is not with me physically at this very moment, I feel that each one of them hopefully knows how much they truly are a part of me. They say that blood is thicker than water and it also leaves a deep purpleish red mark on every fiber of our being. Water is clear and goes away, but the deep roots of family ties can never be replaced. I have been thinking about this word for a long, long, long time. I have analyzed this word until I am blue in the face. How often do we make an assumption that is wrong? How often do we make an assumption that is right? When we see a person who smiles, holds themselves well and looks like they have the world in their hands, do we assume their happy? When we see someone who has their head down, their posture is slumped and they look sad, do we assume their not happy. However, looks are deceiving and sometimes the most beautiful people are carrying burdens so deep that not even the most compassionate person on earth would ever understand. Sometimes the person who looks misunderstood, backward and unhappy, may just be having a bad day, and for the most part that person is so content with life that it’s scarey. How often to we ask someone, are you happy? Are you ok? Is their anything I can do to ease your burden? Yet, we assume because that person looks the part, that they are truly happy. When my daughter entered the MTC, it was a very difficult day. A lot of assumptions were made. She was nervous, scared, afraid, alone, leaving her family for 18 months. It was absolutely brutal. When she met her companion, she assumed because she was pretty, skinny, and had a beautiful family that her life was perfect. Little did she know that her life has been hard too. It wasn’t easy for her for that first week or two. It took a lot of time for walls to come down, for the spirit to intervene and for trust to be built. I told my daughter to love her companion. I told her to build her up and compliment her. I tried to explain that sometimes when someone doesn’t take the time to ask questions, they make very false assumptions. I know that false assumptions are made about me every day. Yet the one thing I do know is that the only opinion that matters is God’s. He doesn’t have to assume anything about me. I am his daughter. He knows my thoughts, my actions and the true desires of my heart. His opinion is the only one that matters and he doesn’t make assumptions about me. He knows me, he loves me and I have a relationship with Him. It’s pretty amazing to know that God doesn’t have to assume anything about me. He already knows who I am and what I truly hope to be. He really is the only one I need to please at the end of the day. I am not accountable for the wrong assumptions that are made about me, but I am responsible if I make the wrong assumptions about others. The best thing to do if we don’t know the answers, is to see the good in everyone, ask the right questions and love unconditionally. We will never please everyone, their are people who will always see the negetive, and false judgements are always going to be made. Mother Teresa said: If were too busy judging someone, we have no time to love them. So for now, I choose to look less closely, ask more questions and listen with my heart. If someone makes the wrong assumption about me, they probably haven’t taken the time to really get to know me. I truly do want to see the best in others, and a wrong assumption is just an uneducated guess.